How many times have you cleaned a surface only to see grime and dirt still lingering on it afterwards? Although not always visible, that sticky or slimy stuff you do see on surfaces after you clean is called residue. There are times when you have to practically scrape it off in order to get rid of it. This happens because the residue is a substance that remains on surfaces after cleaning or after a chemical process, and is not easily removed. Residue can be a frustrating thing to deal with since it basically attracts more dirt, increasing the existing buildup so subsequent cleaning is harder to accomplish. This buildup then becomes a breeding ground for biofilm to flourish. Biofilms are basically communities of bacteria that form on a surface. They are attracted to moisture and pre-existing dirt and are difficult to remove. As a result, on top of the existing dirt you now have bacteria. Every time you touch the surface you are then touching communities of bacteria that can make you sick. A good visual aid to help you understand the concepts of residue and biofilm is to think about your mouth and your teeth. Your mouth is a moist environment. You brush your teeth and your teeth feel clean. When you eat, particles of food (dirt) remain on and in between your teeth, which is residue. If you don’t brush your teeth often (clean the dirt) then that residue attracts bacteria and plaque starts to form. The plaque on your teeth is Biofilm. The longer you ignore brushing your teeth the more plaque builds up, making it harder and more difficult to remove – think about the dental tools needed to remove plaque from your teeth. These same concepts can be applied to most any surface you can think of that has dirt on it. It is important to clean residue before it turns into a bigger problem. But, how does residue appear in the first place? A big reason that residue appears on surfaces results directly from THE cleaning products being used. The detergents used to clean surfaces have Surfactants (Surface Active Agents) in them. Surfactants are chemical compounds found in detergents. They break down the boundaries between water and oils and/or dirt by holding the dirt in suspension so they can be removed. Most cleaning and disinfecting products contain surfactants and leave a residue on surfaces. There are, however, products on the market that leave a slight residue and one that leaves no residue- keep reading! Not all cleaning and disinfecting products are formulated the same- some have dissolved formulas and toxic chemicals. We have established that most cleaners and disinfectants have detergents that help to remove dirt, but some also contain corrosion inhibitors and stabilizing agents. Others contain highly toxic chemicals. The key to the type of residue left behind: slight, murky or heavy, is found in the formula, or more specifically, the group of surfactants used. 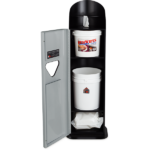 Choose products that are formulated to be safe and are registered with the EPA. Look for products that that are designed to clean multiple surfaces so you are using your time more efficiently when cleaning. Regular cleaning is a must to alleviate the buildup of dirt and grime on surfaces. Remember cleaning is not disinfecting. Cleaning is about getting dirt, sweat and grime off of surfaces. Disinfecting is about killing the germs on surfaces. The distinction helps you understand cleaning can be done daily because you are not waiting for dwell times to take effect. Most cleaning products recommend that the surface be wiped clean after using the product. Contrary to this argument some products can be left to air dry with minimal residue. Again, the formula is an important factor. 2XL is a leading manufacturer of cleaning, disinfecting and sanitizing products. Our passion is to solve customers’ cleaning issues by providing safe, effective and easy-to-use products they love using. 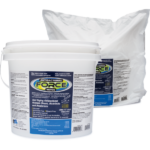 Gym Wipes Professional Formula was developed hand-in-hand with fitness equipment manufacturers. These wipes contain no alcohol, phenol, bleach or ammonia. They are also non-toxic and non-irritating. The formula contains a specialized group of surfactants that effectively cleans the fitness equipment at the gym and at home. The no residue formula is safe for screen displays as well. Yes, you read that correctly- no residue! But, these wipes are not just for the gym! 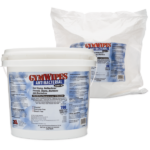 These wipes were designed for general, daily deep cleaning and can be used in restaurants, locker rooms, daycare centers, schools, offices and hospitals. They effectively remove dirt, sweat, grime, and oil so that bacteria are not attracted to the surface. It is formulated to be safe on effective on multiple surface saving you tons of time when you are cleaning. One wipe can clean up to 4 surfaces. 2XL is your trusted cleaning partner for no residue and low residue products that get the job done safely and effectively.